Dealing is in essence an offence relating to the abuse of information, which in this information era has acquired a level of importance equal to, if not exceeding, what was achieved by offences involving property such as theft, misappropriation and criminal breach of trust with the advent of the industrial revolution. The recent Aitken Spence controversy, which led to the resignation from their respective posts of the Chairman as well as the Director General of the Securities and Exchange Commission of Sri Lanka, has brought into focus the provisions of law in force in Sri Lanka for the combat of insider dealing. Insider dealing is in essence an offence relating to the abuse of information, which in this information era has acquired a level of importance equal to, if not exceeding, what was achieved by offences involving property such as theft, misappropriation and criminal breach of trust with the advent of the industrial revolution. “The stock exchange is a cornerstone of the capital market. It is in fact a market where publicly quoted shares are bought and sold by members of the public, both corporate and individual. Share trading is driven by information. Good news drives the share prices up whilst bad news brings them down. The individual investor’s decision to buy or sell as well as the price at which he elects to trade is dictated by the information he holds regarding the relevant shares. Insider dealing is a serious white color crime. It involves the improper use of price sensitive information in breach of confidence. Such conduct has been prohibited in several jurisdictions including Sri Lanka with a zeal that has been described as an “almost international obsession”.2 Insider dealing has been regarded as immoral and likened to cheating at cards. 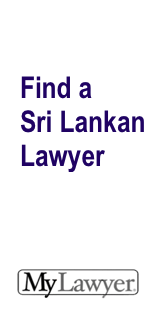 In Sri Lanka, the crime of ‘insider dealing’ has been dealt with in three different statutory contexts. Firstly, Part V of the Companies Act3 contains provisions that seek to define and penalise insider dealings with respect to all companies, whether listed or not. These provisions have not yet been brought into operation.4 Secondly, Part IV of the Securities and Exchange Commission of Sri Lanka Act5 (hereinafter referred to as the SEC Act) contain almost similar provisions, but which are applicable only to listed public companies. Thirdly, the Company Takeovers and Mergers Code of Sri Lanka6 (hereinafter referred to as the Takeovers Code) also prohibits insider dealings in the course of company takeovers or mergers. The type of conduct prohibited by the law relating to insider dealing may be illustrated with two examples. In Lord Advocate v Mackie7, a financial analyst, was given information by the Chairman of a company about the forthcoming issue of a profits warning by the company. The analyst passed on this inside information to two of his colleagues who dealt in those shares making considerable profit. Similarly, in the film titled ‘Wall Street’, the character known as Bud Fox, played by Charlie Sheen, became part owner in an office cleaning company in order to ‘steal’ inside information for a law firm. In terms of the provisions of the Sri Lankan Penal Code8 dealing with offences against property, such information would not be regarded as stolen or misappropriated as something physical has to be taken in order to constitute such offences.9 However, such conduct may come within the scope of the insider dealing provisions mentioned above. In view of the position that the insider dealing provisions of the Companies Act have not yet been brought into operation, and their similarity to Part IV of the SEC Act, it is convenient to focus on the provisions of the latter Act, while noting any significant points of contrast. Part IV of the SEC Act applies with respect to listed securities of all listed public companies. he can be reasonably expected to know is unpublished price sensitive information in relation to those securities. it would be reasonable to expect a person so connected and in the position by virtue of which he is so connected not to disclose except for the proper performance of the functions attached to that position; he can reasonably be expected to know is unpublished price sensitive information in relation to those securities of that other company; and relates to any transaction whether actual or contemplated, involving both the first mentioned company and that other company or involving one of them and securities of the other or to the fact that any such transaction is no longer contemplated. While the above quoted sub-sections of Section 32 constitute the main offences of insider dealing, the remaining five sub-sections of the Section seek to apply the principles of liability to individuals who communicate,10 counsel or procure11 and obtain12 inside information with a view of profit. From the stand point of take-overs and mergers, Section 32(4) is of special interest as it provides that an individual who is contemplating, or has contemplated, making a take-over offer for a company in a particular capacity, shall not trade in listed securities of that company in another capacity if he knows that the information that the offer is contemplated or is no longer contemplated is unpublished price sensitive information in relation to those securities. Section 32(5) merely applies this prohibition to an individual who has obtained such information from another person. All these provisions are expressly made subject to Sections 32( and 32(9) of the Act which provide certain defences. According to Section 32( (a) it will be a good defence to a charge of insider dealing that the particular thing was done “otherwise than with the view to the making of a profit or the avoidance of a loss”. Hence, for example, a person who gives out price sensitive information while drunk or to enhance his self-esteem, will not be liable. Similarly, according to Section 32( (c), a stock broker or dealer who obtains such information in the course of his business as such, and does anything with it “in good faith in the course of that business” will not be liable. According to Section 32(9), an individual who has information relating to any particular transaction will not be liable if he does anything “to facilitate the completion or carrying out of the transaction”. According to the original Section 34(1) of the SEC Act, this connection may be established in one of two ways: firstly, by being a director of the company concerned or a related company14 and secondly, by being an officer (other than a director) or employee of the company or a related company, or by holding a position involving a professional relationship between himself and the first company or a related company, which, in either case, might reasonably have been expected to have given him access to inside information in relation to either company.15 A mere shareholder would not be an insider according to this definition. The provisions of the SEC Act, modelled on the English legislation of 1985, embrace three distinct classes of persons, namely the so-called true insiders (directors, officers and employees of the body which issued the securities), temporary insiders (those on the periphery of that body who gain access to the information) and, finally, tippees of the information. Compared with this, there are three major extensions of the concept of who is an insider under the 1993 legislation of England. Second, shareholders are included for the first time. Third, a simple ‘access to information’ test replaces the need under the previous legislation to be connected with a company. It has been observed that the UK Act of 1993 imposes liability by reference to ‘informational advantage’ rather than by reference to status”. These extensions are the result of the European Community Directive on Insider Dealing. 23 Accordingly, a local government officer of a District Council will, for the first time, be within the ambit of the legislation, in relation to the Council’s securities. An employee of a foreign government will also be covered, in relation to that government’s securities, as will a UK minister or civil servant in relation to gilts. In that case, a columnist gave other individuals advance information about the contents of his column in the newspaper. It was known that favourable mention of any share in that column would influence the price beneficially. Profits were therefore made by dealing in advance of the publication of the column on the basis of information to be contained in it. Significantly, the information in the columns was not received from any insider of a corporation. It was simply the view of the journalist who wrote it. In terms of the applicable US Law, the columnist was convicted of insider dealing, apparently on the basis that he had taken confidential business information from the Wall Street Journal. It has been suggested that under UK law, which has now based insider liability on informational advantage rather than by connection to an issuer, a similarly placed columnist could also become liable for insider dealing. Such a view, however, would not appear to be correct for the reason that in the UK legislation the statutory definition requires, as we have seen, inside information to come from an inside source. It is unlikely that a court would hold that information generated by a columnist himself would be regarded as information obtained through having ‘access’ to it. The amendment, appears to follow US rather than UK law, and does not expressly require that the information should have emanated from an inside source. A serious deficiency in the SEC Act is the glaring omission to provide against the use of price sensitive information gathered in the course of the discharge of their duties by the members, officers and servants of the Securities and Exchange Commission. The Takeover Code provisions30 will cover such persons, but are restricted to the offer period. However, a member, officer or servant of the Securities and Exchange Commission who trades in listed securities using price sensitive information acquired by him by virtue of being a Director or person otherwise connected to a company, can still be liable for insider dealing under Section 32 of the SEC Act. It is useful to consider some special categories of persons who are or ought to be liable for insider dealing in the context of the SEC Act. A shareholder not having such control is unlikely to be in that position and consequently is effectively excluded from the United Kingdom legislation although remaining nominally, within it. It is necessary to consider amending the SEC Act in this respect. the class need not be restricted to them. In terms of the original Section 34(1) of the SEC Act, temporary secretaries, security staff, company printers and many others could potentially be regarded as having access to information by virtue of their employment or “position involving a professional or business relationship”34. Thus, a window cleaner who in the course of cleaning the windows obtains inside information may not be regarded as an insider even temporarily. It is however, important to note that the 2003 amendment, which imposes liability by reference to ‘informational advantage’ rather than by reference to status, has spread the net wider and could also catch up the inquisitive window cleaner. In this context, the decision in R v Fisher37 is of considerable interest. The case concerned shares in Thomson T Line plc, the greater part of which were family-owned. When the family decided to sell their shareholdings they instructed a merchant bank to act on their behalf. The defendant showed interest as a prospective buyer and spoke to an executive of the merchant bank about a possible purchase of shares by him. The bank obtained instructions from the shareholders to deal with the defendant, but the shareholders did not regard him as a serious buyer and reached agreement with another prospective purchaser, Diamond Ltd, to sell the family shareholding in Thomson T Line plc for 50p a share. The shareholders instructed the executive at the merchant bank to tell the defendant what was happening. Before doing so the executive checked the facts with Diamond’s merchant bank and ‘was told that an announcement of the deal was to be made in the financial press the following morning. The decision illustrates the difficulties that could arise from the language of the 1985 UK legislation on which the SEC Act provisions are based. The extremely technical nature of the language and the problems of interpretation that could arise have been highlighted in a recent article on this subject.40 Under the applicable provisions, it seems unlikely that the defendant was a Tippee at all. The merchant bank, with which he was in contact, was acting not for Thomson T Line but for a shareholder in 25% of the capital who, under that legislation, was not even an insider. It was therefore not in a business or professional relationship with Thomson T Line and neither was its executive. In fact the executive was only connected with the merchant bank, not with Thomson T Line at all. In those circumstances it is difficult to see how the defendant could ever have been said to have knowingly obtained information from an individual connected with Thomson T Line, unless it had been shown that he knew that the source of the information was someone who was connected. Problems of this nature have been greatly overcome in England by the 1993 legislation, under which individuals become Tippees if the direct or indirect source of their information is an insider.41 As with insiders, Tippees must be individuals and they can only be Tippees if they know the information they have is inside information and if they know that the direct or indirect source is an insider. There is no need for a Tippee to know the identity of the source of the tip, provided that he knows that the direct or indirect source of the tip was an insider. The recent amendment to the SEC Act42, through its broader definition of ‘connection’ with the company, has extended the liability of a Tippee even beyond the scope of the 1993 legislation of UK. The important elements of this definition requiring further scrutiny are: (i) specificity, (ii) particularity, (iii) publicity, (iv) price-sensitivity and (v) confidentiality. The information should not be general in nature, and must be particular. However, under the SEC Act, there may be some circumstances in which general information may fall within the definition of inside information. For example, a proposed take-over is information that is certain to affect the equity securities of two companies, the bidder’s and the target’s. It may also affect the prospects of other companies in the sector, at least if the take-over bid is seen as likely to succeed. Even if not covered by the SEC Act provisions, this kind of situation will be caught up by the provisions of the Takeovers Code, discussed later in this article. Similarly, a proposed new tax on a particular sector, like Banks or Oil Companies will affect equity securities of all the companies subject to the new impost and should still be considered inside information. It is not altogether clear weather proposed general changes in the level of taxation would be too general to qualify as inside information. No guidance has been given in the SEC Act as to what is meant by the phrase “likely materially to affect the price of those securities.” The Takeover Code requires a company to make an announcement in circumstances where there is some “untoward movement in its share price.”54 The London City Takeover Panel, for the purposes or requiring statements about sharer price movements uses a 10% movement on one day as a benchmark.55 Takeovers are the one clear cut case for potential insider dealers. Where a bid is just about to be launched at a high price, no one can be in doubt that target’s share price will rise on the announcement, although by how much will depend on how the market sees the chances of the bid or any rival bid succeeding. While the market players may experience some anxiety, prosecutors have the advantage of the hindsight. The information should also be of a confidential nature. Although the word ‘confidential’ does not appear in the Act, this element may be inferred from the requirement that information should emanate from someone ‘connected’ to the company by virtue of his position as an insider, which it was reasonable to expect such a person not to disclose, except for the proper performance of his duties. The Act sought to impose criminal liability only on someone who knew or ought to have realised that there had been a breach of confidence concerning information from within a company that allowed him or another to profit from the breach by dealing in corporate securities. It is interesting to note that the US Supreme Court has, by contrast, emphasised the breach of a fiduciary duty as a vital element in insider dealing.56 An illustrative decision is SEC V Texas Gulf Sulphur Co.57 TGS made a substantial mineral discovery in Canada. In order to acquire the land surrounding the discovery site at a favourable price TGS publicly denied rumours of the discovery. At the same time certain TGS employees familiar with the discovery purchased TGS stock. If they had disclosed the mineral discovery they would have violated their fiduciary duty of confidentiality. These employees were found guilty of insider trading whilst TGS was guilty of making materially misleading disclosures. It is important to note that there is considerable overlap between the insider dealing provisions of the SEC Act and the provisions of the Takeover Code. It will be noticed that the Code provisions are applicable only during the pendency of a takeover offer, while the provisions of the Act are more general. However, the Code provisions can be used even to charge a company for insider dealing, which will not be possible with the SEC Act as its provisions only catch up acts of ‘individuals’. The Code provisions do not use terminology introducing a subjective element, whereas the provisions of the Act are studded with concepts such as ‘knowingly, ‘reasonable’ and ‘good faith’ that could give rise to major difficulties of proof, and considerable amount of litigation. The Takeover Code does not expressly provide for any defences. The SEC Act provides for certain defences, such as those contained in Sections 32( and 32(9) of the Act, which appear to be too liberal. In the event of a person charged with the contravention of Rule 28(1) taking up a defence in the lines of Section 32( (a) of the Act, the question would arise as to whether the Code will be deemed to be ultra vires the Act insofar as the offences created by the Code are wider than the offences created by the Act. elevation of ‘information’ into a species of property protected by law. While legislation such as the Code of Intellectual Property Act68 are manifestations of this transformation, the draft Computer Crimes Bill69 and other such legislation in the offing reflect the underdeveloped state of the law. Although insider dealing has been prohibited both by the Companies Act and the SEC Act in almost similar language, only the SEC Act provisions are operative in Sri Lanka. The provisions of Part IV of the SEC Act, however, apply only to listed securities of listed public companies. These provisions are also deficient in several respects and require urgent amendment. In the takeover context, insider dealing is also regulated by the Takeover Code, which is a rule made under the SEC Act. As noted above, there is a great deal of overlap and differences between the SEC Act provisions and the Takeover Code provisions on insider dealing. In this scenario, it is unfortunate that the recent amendments to the SEC Act did not contain any elaborate amendments relating to insider dealing70. Well considered – if not innovative – legislation, as well as some reappraisal of judicial attitudes, is absolutely essential to combat theft, misappropriation and abuse of information in this information age, in which information has acquired greater value than corporeal property. Any delay in bringing about these legislative and attitudinal changes will undermine the credibility of the capital market and adversely affect the national economy. 1 C.R.de Silva, ‘A Factual Description of the Statutory Elements of the Offence of Insider Dealings in Sri Lanka’, (2000-2001) Meezan, page 23. 2 Rider, “Policing the City-Combating Fraud and Other Abuses in the Corporate Securities Industry”, (1988) 41 Current Legal Problems 47 at page 48. 3 The Companies Act No. 17 of 1982, as subsequently amended. 4 Section l(2)(b) of the Companies Act, supra note 3, provides that the provisions of Part V of the Act shall come into operation on such date as the Minister may, by Order published in the Gazette, specify. No date has been so far been specified by the Minister for this purpose. However, the other provisions of the Companies Act, came into operation on 2nd July 1982, which was the ‘appointed date’ fixed by the Minister by Order published in Gazette No. 199/14 dated 2nd July, 1982 in terms of Section 1(2)(a) of the Companies Act. of Sri Lanka Part II dated 18th October 2002 and passed by Parliament on 28th January, 2003 (but not certified by the Speaker at the time of going to press). 6 The Company Take-overs and Mergers Code, 1995 promulgated as a rule having the force of law in terms of Section 53 of the Securities and Exchange Commission of Sri Lanka Act, , and published in the Gazette Extraordinary of the Democratic Socialist Republic of Sri Lanka, Part I: Sec (1) of 16th June, 1995. See also, Saleem Marsoof, ‘Takeover Offers and their Ramifications’ (1998) Attorney General’s Law Review 90. 7 Financial Times, 31st March, 1993. 8 The Penal Code of Ceylon, Sections 366 and 386. 9 See, Nagaiya v Jayasekere (1927) 28 NLR 467. 10 The Securities and Exchange Commission of Sri Lanka Act, supra note 5, Section 32 (7). 13 Ibid., Sections 32 (1) and 32(2). 16 The Company Securities (Insider Dealing) Act (England) 1985. 17The Criminal Justice Act (England) 1993. 20 ‘Issuer of securities’ includes any body, whether incorporated or not and wherever it is incorporated or constituted (The Criminal Justice Act (England) 1993, Section 60(2)). 21 ‘Public sector bodies’, means any Government, local authority, or Central Bank of a Sovereign State wherever they are and any international organisation of which the UK or any other member of the European Union is a member (The Criminal Justice Act (England) 1993,60(3)). 22 Michael Ashe, ‘Who is an Insdier?’,The Fiduciary, the Insider and the Conflict: A Compendium of Essays, Edited by Rider and Ashe (1995) page 75 at page 77. 23 Council Directive (89/592/EEC) Article 2 and 2(1). 26 The Securities and Exchange Commission of Sri Lanka (Amendment) Act, 2003. The bill relating to this Act was published in the Gazette of the Democratic Socialist Republic of Sri Lanka Part II dated 18th October 2002 and was passed by Parliament on 28th January, 2003 (but had not been certified by the Speaker at the time of going to press).